[169 Pages Report] The Critical Infrastructure Protection market size is estimated to grow from USD 110.41 Billion in 2017 to USD 153.16 Billion by 2022, at an estimated Compound Annual Growth Rate (CAGR) of 6.8%. The base year considered for the study is 2016 and the market size estimated is from 2017 to 2022. The objective of the report is to define, describe, and forecast the Critical Infrastructure Protection market on the basis of security technologies, services, verticals, and regions. The report analyzes the opportunities in the market for stakeholders by identifying high-growth segments of the CIP market. Furthermore, the report strategically profiles the key players of the CIP market and comprehensively analyzes their core competencies, such as new product launches, mergers and acquisitions, partnerships, agreements, and collaborations. Moreover, the report also covers detailed information regarding the major factors influencing the growth of the market (drivers, restraints, opportunities, and challenges). The CIP ecosystem comprises major vendors, such as BAE Systems (UK), General Dynamics Corporation (US), Honeywell International Inc. (US), Lockheed Martin Corporation (US), Northrop Grumman Corporation (US), Raytheon Company (US), Airbus Group SE (Netherlands), Hexagon AB (Sweden), Johnson Controls International plc (Republic of Ireland), Thales Group (France), Teltronic S.A. (Spain), OptaSense (UK), Motorola Solutions, Inc. (US), and Huawei Technologies Co., Ltd. (China); service providers; and system integrators. Other stakeholders include CIP system and solutions providers, consulting firms, IT service providers, Value-Added Resellers (VARs), enterprise users, and CIP technology providers. These Critical Infrastructure Protection Solutions Vendors are rated and listed by us on the basis of product quality, reliability, and their business strategy. Please visit 360Quadrants to see the vendor listing of Critical Infrastructure Protection Solutions. Detailed analysis and profiling along with competitive leadership mapping to get detailed information about the market competitors on the basis of their product offerings and business strategies. The report reviews the major players who offer CIP systems, solutions, and services. Additionally, the report also outlines the findings and analysis on how well each CIP vendor performs within the MarketsandMarkets criteria. The Critical Infrastructure Protection market size is expected to grow from USD 110.41 Billion in 2017 to USD 153.16 Billion by 2022, at a Compound Annual Growth Rate (CAGR) of 6.8% during the forecast period. 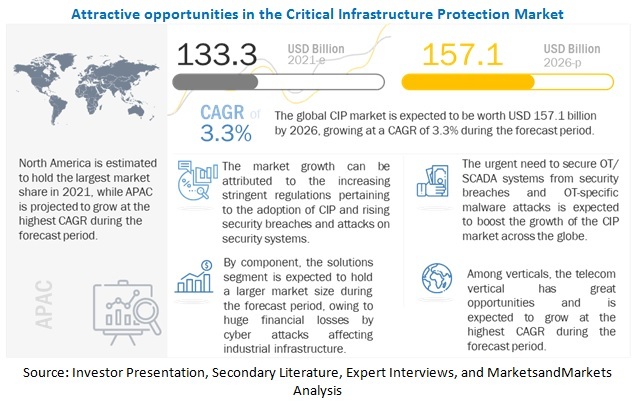 The major growth drivers of the CIP market include the rise in security breaches and cyber-attacks, stringent government regulations and increasing adoption of best practices, and high investment in smart grid technologies. The network security segment is expected to grow at the highest CAGR during the forecast period. Advancement in mobile computing, cloud computing, and Bring Your Own Device (BYOD) trend has proliferated the threat level on the critical infrastructure network. However, the physical security segment holds the largest share in the Critical Infrastructure Protection market in 2017, on account of the increased instances of physical attacks from radical terrorist organizations and criminal groups, which disturb the business operations of the various industry verticals. The consulting services segment is expected to grow at the highest CAGR during the forecast period, while the professional services segment is expected to hold the largest market size in 2017. The consulting service providing companies are helping clients in designing and implementing CIP programs, developing capital investment strategies, assessing and monitoring infrastructures, and meeting compliances and standards. In addition, the maintenance and support services segment holds a major share of the CIP services market in 2017. 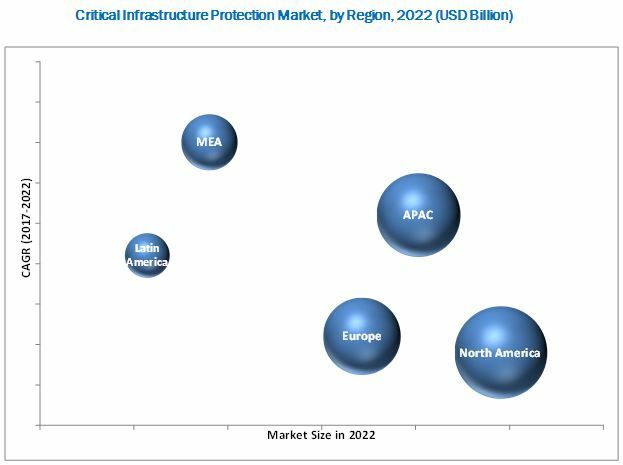 The Critical Infrastructure Protection market has been segmented on the basis of region into North America, Europe, Asia Pacific (APAC), Middle East and Africa (MEA), and Latin America to provide a region-specific analysis in the report. North America is expected to hold the largest market size and has emerged as the leading region in the adoption and implementation of CIP solutions. MEA is expected to grow at the highest CAGR in the CIP market, owing to the increased adoption of physical and cyber security systems and solutions for protection of oil fields, smart grids, and transportation systems. The Critical Infrastructure Protection market faces challenges such as high cost of implementation and issues related to implementation of comprehensive security solutions in distributed facilities. Moreover, factors such as complexity in deployment of security infrastructure and the lack of interoperability between security systems limit the growth of the market. Major vendors that offer cyber security solutions and services across the Critical Infrastructure Protection market are BAE Systems (UK), General Dynamics Corporation (US), Honeywell International Inc. (US), Lockheed Martin Corporation (US), Northrop Grumman Corporation (US), Raytheon Company (US), Airbus Group SE (Netherlands), Hexagon AB (Sweden), Johnson Controls International plc (Republic of Ireland), Thales Group (France), Teltronic S.A. (Spain), OptaSense (UK), Motorola Solutions, Inc. (US), and Huawei Technologies Co., Ltd. (China). These companies have implemented different types of organic and inorganic growth strategies, such as innovative product launches, mergers and acquisitions, and partnerships and collaborations to expand their offerings in the CIP market.